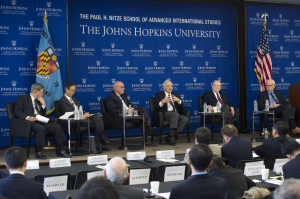 Former negotiators and diplomats recall the first North Korean nuclear crisis and the negotiation of the Agreed Framework on the agreement’s 20th Anniversary (October 2014). Photo: © 2014 Kaveh Sardari. Most of the people who invoke the failure of the Agreed Framework couldn’t tell you the first thing about it—other than that they “know” it didn’t work because North Korea now has nuclear weapons. But they are misguided. The 1994 Agreed Framework was a good deal. Would that we had been wise enough to keep it. Let’s start with three statements about North Korea and the Agreed Framework. These statements are basically accurate, but there are some very important clarifications and corrections. And it is within those corrections and clarifications that the logic of the Agreed Framework is evident. Assumption 1: In 1994, North Korea already had enough plutonium for one, possibly two nuclear weapons. Not quite. The US intelligence community believed North Korea had a stockpile of undeclared plutonium, but did not know whether that stockpile was a few grams or a few kilograms. There were good reasons to suspect that North Korea had a stockpile of undeclared plutonium. In 1989, the DPRK shut down the reactor at Yongbyon for about 70 days. North Korea may have unloaded some or all of the fuel rods in the reactor’s core during this period. There are good reasons for such a suspicion. Satellite images show the DPRK constructed what appear to be camouflaged waste tanks. Environmental samples taken by the IAEA showed the DPRK had conducted more reprocessing “campaigns” than Pyongyang had declared. But how much fuel was unloaded? How much plutonium was in the fuel? The US Joint Atomic Energy Intelligence Committee assessed the worst-case scenario of 8.3-8.5 kilograms of plutonium, revised down from an earlier estimate of 12 kilograms. That is enough for “one, possibly two” nuclear weapons depending on a number of factors such as how much plutonium the North Korean design required and how much might be lost during processing. This was a worst-case estimate. While it is important to ensure that our policies hedge against worst-case estimates, it is also important to hedge against uncertainty. The North Koreans might not have had more than few grams of separated plutonium. Or perhaps they had a few kilograms, but not enough for a bomb. We simply did not know then, and do not know now, how much plutonium North Korea squirreled away. The North Koreans, of course, admitted to only a few grams in 1994. Interestingly, they denied it again in 2006 when they declared a plutonium stockpile of 37 kilograms. Assumption 2: North Korea cheated on the Agreed Framework. Well, again, not quite. We should give the devil his due: North Korea largely kept its commitments regarding its plutonium-production capabilities. Starting a secret enrichment program, on the other hand, clearly violated understood expectations, a classic example of a transgressor obtaining a slight advantage in comparison with a relatively large inconvenience imposed upon the aggrieved party. This will get its own section. “If North Korea abandoned the Agreed Framework P’yongyang could resume production of plutonium. Reprocessing the spent 5 MWe reactor fuel now in storage at the Yongbyon site under IAEA safeguards would recover enough plutonium for several more weapons. Restarting the 5 MWe reactor would generate about 6 kg per year. The remaining 8,000 spent fuel rods—containing about 20-28 kilograms of plutonium—were placed in canisters and under IAEA safeguards. The 5 MWe reactor at Yongbyon was shut down and construction stopped at the 50 MWe reactor at Yongbyon and the 200 MWe reactor at Taechon. In 1998, the United States accused North Korea of building a secret plutonium production reactor and reprocessing facility underground, near a place called Kumchang-ri. Well, strictly speaking, DIA suspected that Kumchang-ri was an underground reactor and someone fed this to the New York Times, which ran it under the headline: NORTH KOREA SITE AN A-BOMB PLANT, U.S. AGENCIES SAY. The United States negotiated access to the site. When US inspectors arrived, they could not determine the purpose of the site, but concluded that Kumchang-ri, laid out as a grid of tunnels, was “unsuitable” for a nuclear reactor and “not well designed” for a reprocessing facility. The Agreed Framework was premised on a transformation of the political and economic relationship, a perhaps too ambitious expectation since even a DPRK without nuclear weapons is fundamentally unlikeable. North Korea’s human rights situation remained appalling. And the North Koreans continued to show an appalling enthusiasm for grabbing people, whether Japanese abducted in secret during the 1970s or Americans detained in recent years. The North Koreans also continued to develop, test and sell increasingly long-range ballistic missiles, something the Clinton administration sought to address after the 1998 Taepodong test. And, of course, we now know that the Clinton Administration was starting to get wind of the relationship with AQ Khan—which ultimately resulted in the missiles for centrifuge barter that would create so much turmoil in 2002. But in terms of the fundamental purpose of the agreement—to freeze the DPRK’s plutonium production capabilities—Pyongyang complied. Assumption 3: The Agreed Framework collapsed because North Korea started a centrifuge program. Again, not quite—but starting a secret centrifuge program certainly didn’t help, that’s for damned sure. The Agreed Framework was already under a lot of pressure as the Clinton Administration drew to a close. Congress exercised its power of the purse to involve itself in the implementation of the Agreed Framework, resulting in irregular deliveries of heavy fuel oil to North Korea and delays to the construction of light-water reactors. Even if Kumchang-ri turned out to be a dead-end, the leaks had weakened the agreement. And North Korea’s missile program, following the shock of the 1998 Taepodong test and continuing sales abroad, was a significant barrier to normalization of relations. The Clinton administration had asked former Secretary of Defense William Perry to review US policy toward North Korea. His approach, dubbed the “Perry Process,” implied seeking to build additional agreements on top of the Agreed Framework—starting with an agreement to end North Korea’s development of long-range ballistic missiles. The Clinton administration was this close to an agreement on missiles when the clock ran out. The Clinton administration, too, knew about North Korea’s centrifuge work—and had pressured Pakistan to cut off Pyongyang. The newly installed Bush administration undertook a policy review that stretched into 2002. The result of this review, it is often forgotten, was a version of the Perry Process, safely rebranded as the “bold approach.” This is forgotten because, before anyone could tell the North Koreans, the US received intelligence that indicated North Korea’s centrifuge program was much further along than previously thought. While the US intelligence community had known about North Korea’s interest in centrifuges, the scale of the procurement suggested a much more mature program. I do not want to suggest, as others have, that the DPRK’s enrichment program was purely for civil purposes. The North Koreans were clearly, in my view, giving themselves a second route to nuclear weapons. But the Bush administration had a fundamental choice: Under the Perry Process, the approach was to treat North Korea’s centrifuge program like its ballistic missile program or its abductions of foreign citizens—yet another instance of terrible North Korean behavior that had to be dealt with in time. In this case, the United States might have negotiated a new agreement to complement the freeze on the DPRK’s plutonium program provided by the Agreed Framework. The alternative, of course, was to blow up everything. Or, as John Bolton would write with exceptional candor, “This was the hammer I had been looking for to shatter the Agreed Framework.” The phrasing—“had been looking for”—is telling. I think this was the wrong choice—although I do suspect a Gore Administration might have let the Agreed Framework succumb to political pressures under the same circumstances. The Perry Process was always about bigger carrots and bigger sticks, which is how we ended up with Perry suggesting we attack North Korea in 2006. We’ll never know how a Gore administration would have responded to new intelligence about the maturity of the North Korean enrichment effort. The politics though, don’t change the merits. Why on earth would our response to North Korean bad behavior be to free them from their obligations not to produce plutonium? Still, no one listens to me! The Bush administration decided to suspend US obligations under the Agreed Framework. The consequences were pretty straightforward. North Korea “effectuated” its withdrawal from the Nuclear Nonproliferation Treaty, opened the cans of spent fuel and separated out the plutonium, restarted Yongbyon to produce even more plutonium, then conducted a nuclear explosion in 2006. I guess that showed ol’ Kim Jong Il. This policy was such a rousing success that the Bush administration used the Six Party Talks to renegotiate a much watered-down version of the Agreed Framework with North Korea. Of course, Bush didn’t call it that. (And since Bush had criticized the Agreed Framework as a mere “freeze” instead of a complete, verifiable and irreversible dismantlement of North Korea’s nuclear programs, they dredged up an archaic word—“disablement”—that sounded enough like dismantlement to save the President from any embarrassment. In February 2007, North Korea agreed to shut down its main nuclear reactor and allow UN inspectors back into the country to verify its actions. In exchange, we and our Six-Party partners provided energy aid, and the United States agreed to remove North Korea from our list of state sponsors of terror. Tell me how that isn’t an off-brand Agreed Framework, and I’ll laugh in your face. The United States even agreed to provide North Korea with light-water reactors, the element of the deal the Bush administration criticized most directly. Strangely, Bush doesn’t mention that in his memoir. The fundamental logic of the Agreed Framework was sound. North Korea had a small, unknown stockpile of plutonium in 1994. It was on the verge of having much, much more. The United States successfully froze that stockpile—a freeze that lasted eight years. And when the Bush Administration chose to “shatter” the Agreement (Mr. Bolton’s characterization, not mine) the consequences were clear. North Korea has increased its stockpile of plutonium to more than 60 kilograms and conducted three nuclear explosions. Moreover, the United States failed utterly to constrain North Korea’s uranium enrichment program, which is now the major source of uncertainly about the size of North Korea’s nuclear stockpile. The same President who walked away from the agreement spent the final years of his term trying to resurrect it, albeit under a different name to avoid any admission of failure. The Agreed Framework was a very good deal even it if was an imperfect one. I am reluctant to draw too many conclusions about the framework announced to limit Iran’s nuclear program, but perhaps those fiddling with purse strings in Congress or looking for a hammer when they get into office should see the Agreed Framework as a cautionary tale. On the other hand, “disincrease” isn’t taken yet. So there’s that. Jeffrey Lewis is Director of the East Asia Nonproliferation Program at the James Martin Center for Nonproliferation Studies (CNS), Monterey Institute of International Studies, and a frequent contributor to 38 North. Solving the North Korean Nuclear Puzzle, eds. David Albright and Kevin O’Neill (Institute for Science and International Security, 2000), 93-96. There is also the issue of North Korea’s IRT reactor. The JAEIC assessed that the amount of plutonium produced and separated was at most a few hundred grams, but others including the Department of Energy made higher estimates up to 1-2 kilograms. See: David Albright and Paul Brannan, The North Korean Plutonium Stock, February 2007, Institute for Science and International Security, February 20, 2007.